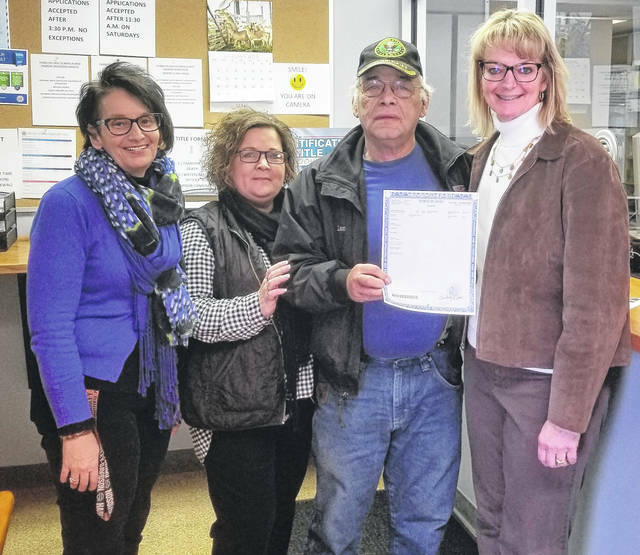 Shown, from left, are Title Deputy Clerks Sophia Watson and Kim Pfleiderer with customer Lon Combs and Clerk of Courts Kim Bood. Combs was the first to receive his car title in the new format. MOUNT GILEAD — Lon Combs was the first customer to receive a title in the new 8 1/2 inch format at the Morrow County Title Department on Tuesday. Clerk of Courts Kim Bood said the rollout of the new title format went well on Tuesday January 22. Morrow county is one of three counties in the state currently using the redesigned titles. Morrow County was chosen as a pilot county for the project. Other counties in the state will follow with the new titles in March. Bood said that the new Saturday hours at the Morrow County Title Department have gone smoothly. They have had several customers every Saturday since the new hours started Jan. 5. Saturday hours are 8 a.m. until noon. The goal of the Title Department is to improve customer service with the new hours. Bood said it is a convenience for customers because the Bureau of Motor Vehicles (BMV) has hours on Saturday morning. Customers need to get the titles for their car before they get registration at the BMV.